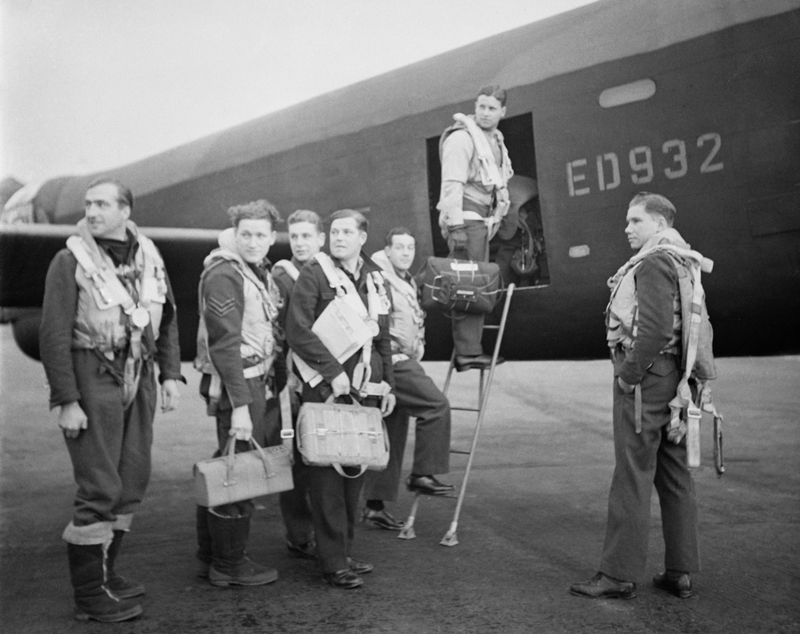 The youngest Squadron Leader of the Dam Busters, and one of the youngest pilots, was a local man. 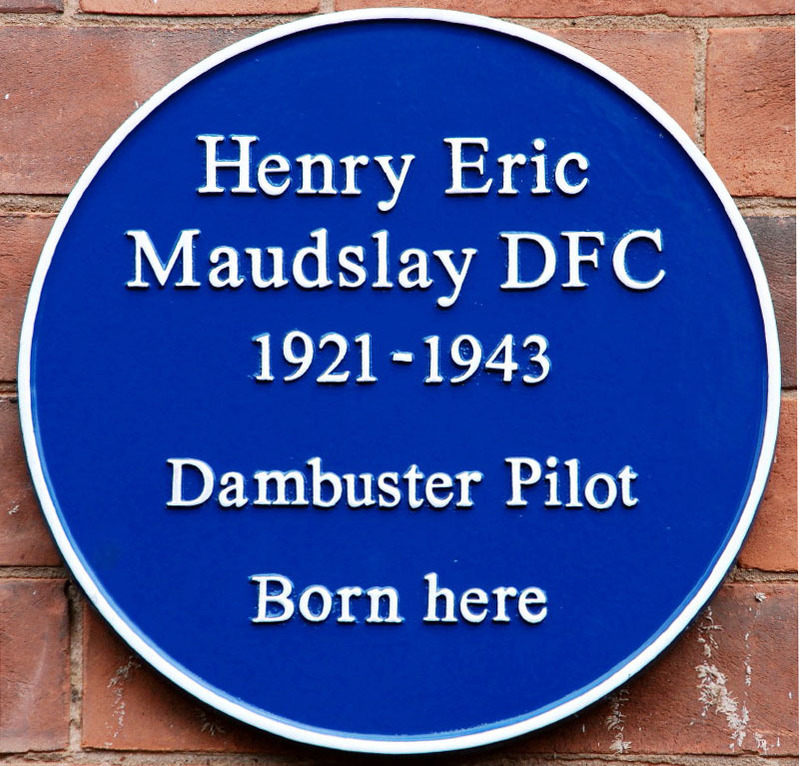 Henry Eric Maudslay was born at 1 Vicarage Road, Lillington on 21 July 1921. The Maudslay family had been involved in various branches of engineering for several generations. An earlier Henry Maudslay was the father of the machine tool industry and one of the greatest engineers of the Industrial Revolution. Reginald Maudslay, young Henry’s father, was the founder of the Standard Motor Company in Coventry, and another member of the extended family was Managing Director of the Maudslay Motor Company, yet another Coventry car maker. From prep school in Gloucestershire Henry went on to Eton where he excelled at athletics and rowing. He was by all accounts a modest and unassuming young man. 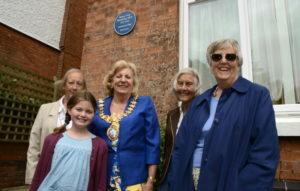 His family had moved from Leamington to Sherbourne near Warwick and by the time Henry had completed his education at Eton, at the start of the Second World War, they were living in Willersey near Broadway. As a teenager Henry had volunteered for service in the Royal Air Force and was called up in July 1940. He quickly demonstrated an aptitude for flying and was said to be a born leader. Within two years he had received several promotions and had been awarded the Distinguished Flying Cross. He had flown on over forty operations including several of the thousand-bomber raids. In January 1943, while serving with 50 squadron at Skellingthorpe, he was one of those selected by Wing Commander Guy Gibson DSO DFC to join the newly-formed 617 squadron for a special operation. He joined 617 squadron at Scampton as a Squadron Leader and the commander of B Flight. He was barely twenty-one years old and the youngest of the 617 squadron pilots. Few aircrew in 617 squadron knew what their top-secret mission would involve. Their training involved flying the four-engined Lancaster at a speed of exactly 232 mph and at an altitude of 60 feet and delivering a bomb weighing almost 10,000 pounds within a few feet of a target. The crews had just six weeks to hone their skills. Henry Maudslay had a lucky escape when on one of his practice drops over the sea at Reculver in Kent. His Lancaster ED933 was seriously damaged by the plume of water and shingle thrown up by the impact of the dummy bouncing bomb (codenamed Upkeep) hitting the water. He managed to nurse the aircraft back to Scampton where it underwent major repairs to the bomb bay fairing. On 14 May 1943 Henry Maudslay and a fellow 617 squadron pilot and colleague, Norman Barlow, an Australian, were witnesses to the will of another 617 skipper,William (Bill) Astell. Bill wrote home to his parents in Manchester enclosing a copy of the will and joking that the Air Force had some ‘funny ideas’ about telling all squadron members to make a will. Fate would decree that none of these three pilots or their crews would return from the mission. Their lives would end within a few miles from each other in the flat lands of north Germany. The crews were finally briefed about the operation they were about to take part in, code-named ‘Operation Chastise’ whose objective was to breach dams in the Ruhr in Germany’s industrial heartland. Nineteen Scampton Lancasters, each loaded with one of Barnes Wallis’s so-called bouncing bombs, were to carry out the raid, led by Guy Gibson. On 16 May 1943, Operation Chastise became a reality and Henry Maudslay in Lancaster ED937 – Zebra led his three aircraft away from Scampton at 21.59 hours. Having crossed the North Sea in loose formation, the three aircraft crossed into Germany at tree-top height to avoid the German radar. 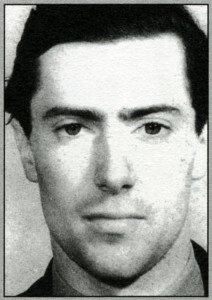 Unbeknown to Maudslay, his colleague Norman Barlow’s aircraft had already gone down before midnight, when it flew into high-tension cables and crashed with the loss of all on board. Less than thirty minutes later, Bill Astell’s Lancaster flying alongside Henry Maudslay met a similar fate when it struck an electricity pylon and crashed in flames. The bomb rolled on a further hundred yards before it detonated. 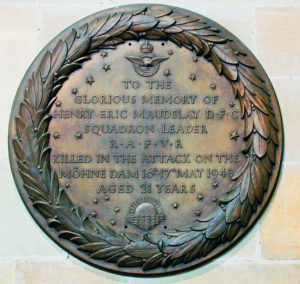 Henry Maudslay in Lancaster ED937 Z arrived over his primary target, the heavily defended Mohne dam, at 00.33 hrs, in time to witness John Hopgood’s Lancaster explode with most of the crew still on board. The raid then began to gather momentum and there were direct hits on the dam which was breached. Gibson then headed eastwards to the Eder dam in company with four aircraft including that of Henry Maudslay and a concerted attack began. The Eder presented a vastly more difficult target than the Mohne. Although undefended, it was surrounded by a ring of hills. If the structure was to be hit, the Lancaster crews had a mere seven seconds to adjust track, speed and height over the water, before the bomb-aimer released the spinning bomb. Gibson called in several aircraft and each in turn began an approach along the lake. After a number of unsuccessful attempts, Maudslay was called up but he experienced similar problems. At 01.45 hours Henry Maudslay made another run on the dam. 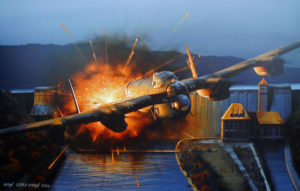 The Lancaster was put into a steep dive over the castle that marked the beginning of the bombing run at the far end of the lake but his bomb was released too late and struck the parapet of the dam without touching the water and blew up instantaneously almost directly beneath the aircraft. The whole valley was lit up for several seconds by a bright yellow glare and a voice came over the R/T – “He blew himself up”. Gibson called up the aircraft asking “Are you OK Zebra?”but the only response was a rather faint, “I think so”. At three minutes to two, Alden Cottam the Canadian Wireless Operator on Zebra sent back a coded wireless signal to Group HQ, Grantham, which read “Special weapon released – overshot dam – no apparent breach.” Nothing further was heard from Lancaster ED937 Z. 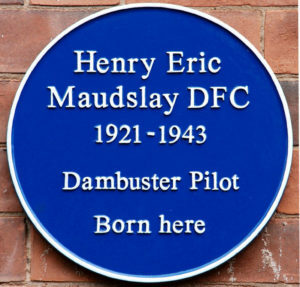 Little is known of the final minutes of Henry Maudslay and the crew of ED937 Z. There has been speculation that the aircraft may have been seriously damaged in some way by contact with tree-tops before the bombing run and more likely by the blast of the bomb when it exploded on the top of the dam. What is known with certainty is that having limped westward from the Rhur, the Lancaster was set ablaze by fire from a Flak battery as it flew at low altitude over the River Rhine lock at Klein Netterden near the town of Emmerich. One of those manning the battery of twelve guns on that night was Herr Feldman who reported that all of the guns were targeted on the lone Lancaster. He recalled that the aircraft was flying at such a low level that the gunfire from the battery cut the tops of the poplar trees along the riverside. ED937 Z crashed and exploded at 02.30 hrs on the morning of 17 May 1943 in a meadow close to the border with Holland. All the crew perished, only Henry Maudslay and the rear gunner Burrows were positively identified. The crew of Lancaster ED937 Z are buried in the Reichswald Forrest Cemetery in Western Germany. 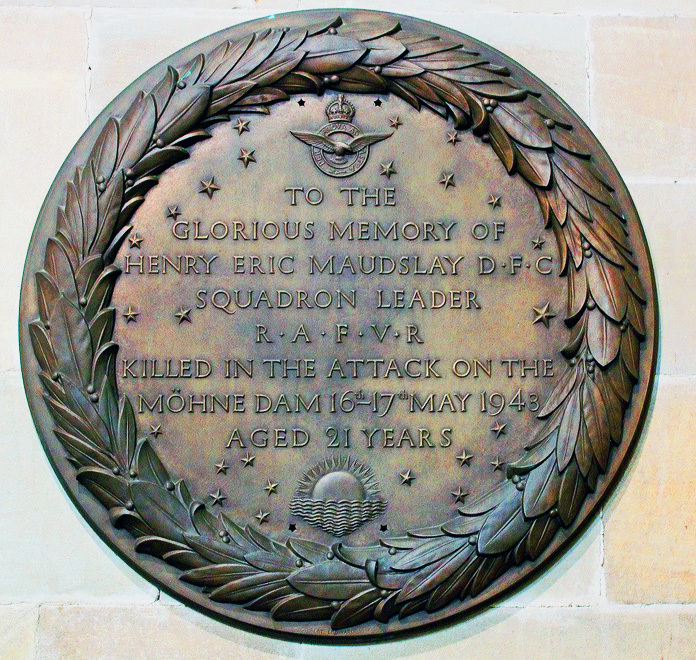 There is a memorial plaque to Henry Maudslay in the church of All Saints’ Sherbourne Park near Warwick. The Royal Air Force Bomber Command Memorial in Green Park, London commemorates the aircrews of RAF Bomber Command who embarked on missions during the Second World War. Of the one hundred and thirty-three aircrew who flew on Operation Chastise, fifty-three lost their lives, while an additional three became prisoners of war. Eight aircraft out of the nineteen failed to return. Gibson was awarded the Victoria Cross, two pilots were awarded the Conspicuous Gallantry Medal and a further six received DSO’s, a total of thirty-three participants received decorations. Over 1300 people were killed on the ground, more than half the lives lost were Allied POW’s and forced-labourers. In the presence of two of Henry Maudslay’s nieces, his great-niece and his great-great niece and two great-great-nephews, a Blue Plaque was unveiled in his memory on 27th July 2017 at his old home, No 1 Vicarage Road Lillington.